Someone FINALLY took me up on it. I’ve offered to show before and after pictures of VeryVintageVegas renovation, restoration and retrovation projects. Welcome to Heidi and Scott’s before and after in the Beverly Green Neighborhood of Vintage Las Vegas. 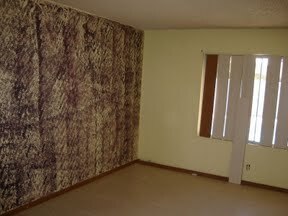 Actually, you’ve seen some of this house before. The VERY FIRST EVER Worst MLS Photo of the Day series was from this house. Let’s start with that one. It was the dirty ashtray that became the focal point of the picture that first made me think about bad MLS pictures. 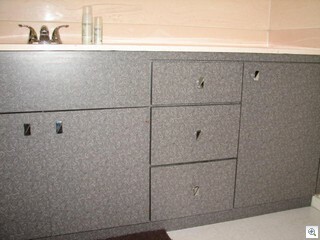 Here’s the same bathroom today after being redone with aqua boomerang Formica facings instead of the brick facade paneling. 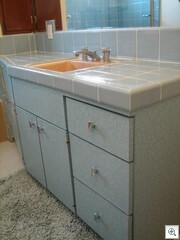 Now it has blue ceramic counters, and tub surround, and no ashtray. 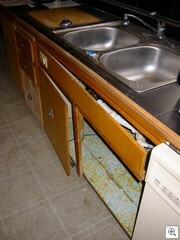 Though the counter wasn’t in bad shape, the tilework around the tub is what caused the old tile to have to come out. 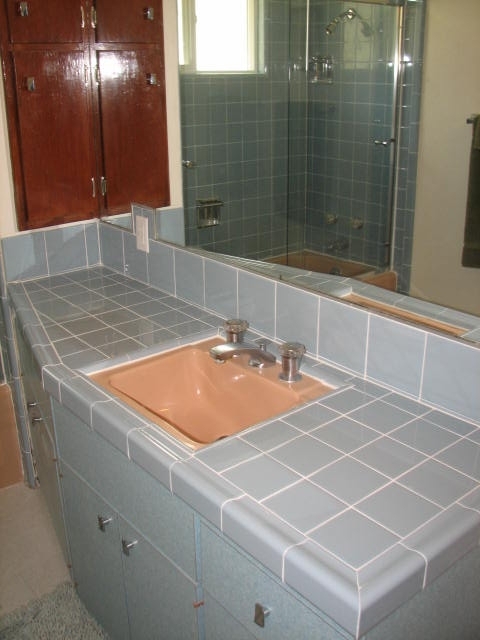 When the vintage tile work isn’t damaged, we recommend re-grouting it. In this case, is was beyond salvation. 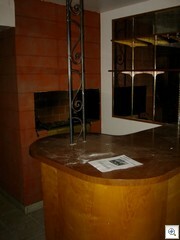 Once I’d started doing the series of Worst MLS Photos, I grabbed another one from the same house. I didn’t think this photo quite did justice to the amazing 3 sided stone fireplace that was the centerpiece of the entire home. Here’s the same rock fireplace in the newly redone living room. 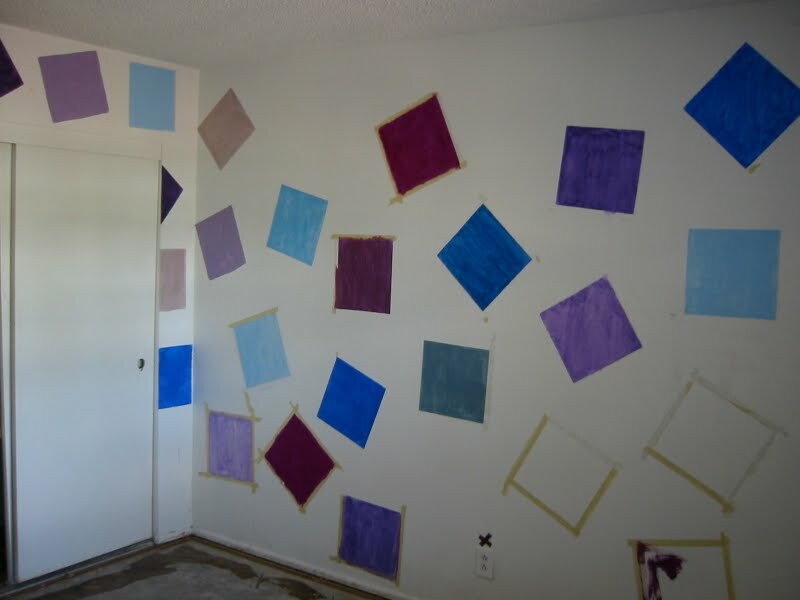 The horrible pergo is gone and was replaced with VCT in one foot squares. VCT (vinyl composite tile) is very retro authentic and is practically indestructible. 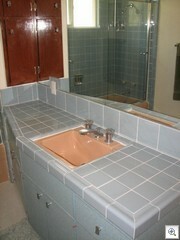 It’s also amazingly versatile for creating patterns or single color accent blocks as they’ve done here. Someone along the way had tried to do some sponge painting. It wasn’t pretty. 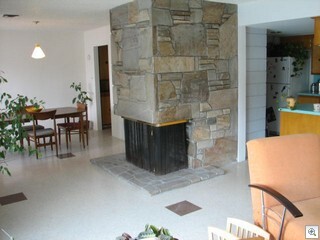 Here’s the east wall of the living room as it was the day Heidi and Scott got the house. 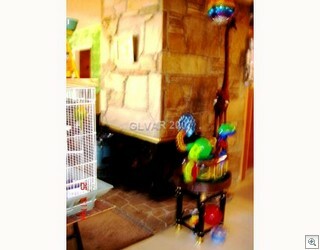 That’s the same wall behind the dining room table in the picture above. Heidi and Scott are especially proud of the kitchen. 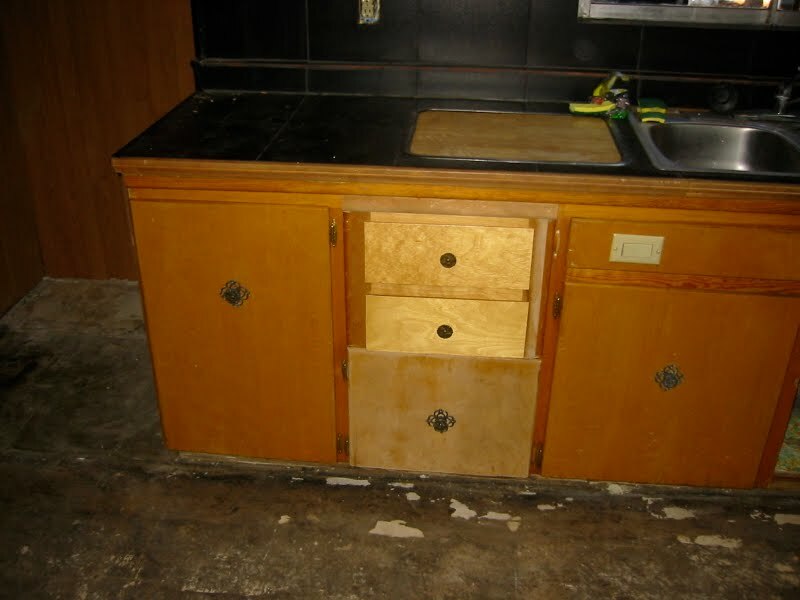 A local cabinet maker was able to faithfully reproduce the missing doors and drawer fronts. (Yes, we know how to reach him). Most people would have ripped out the kitchen and started over. 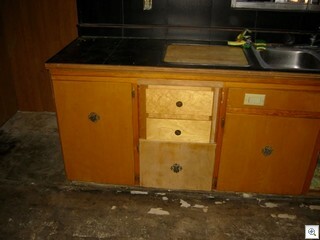 The undamaged parts of the cabinets were beautiful, original, and had never been painted. Heidi and Scott saved a bundle by saving the kitchen. 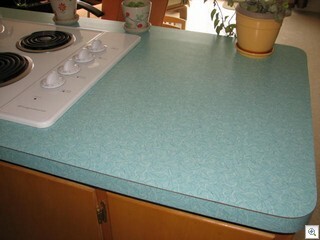 And the real killer in the kitchen is the new aqua boomerang Formica countertops. 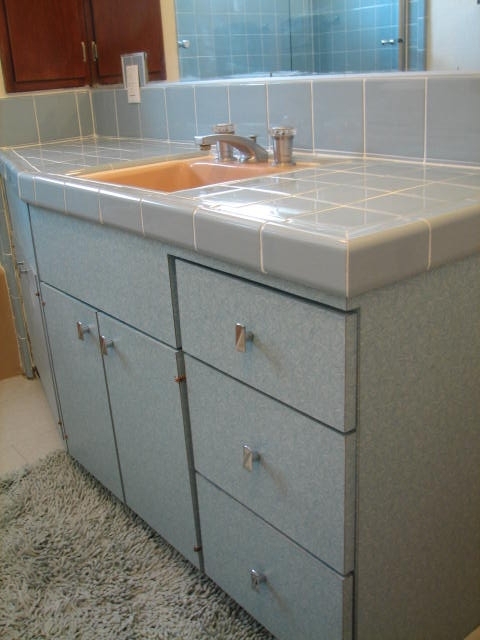 This is the exact color and pattern that was in the upstairs bathroom of the 1956 mid mod that I grew up in, back in Columbus. 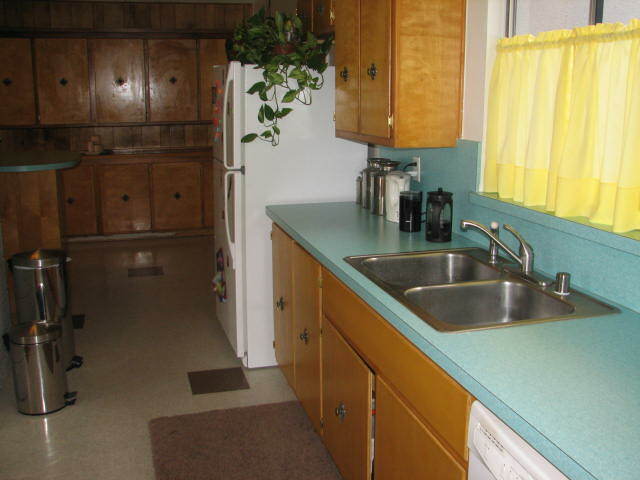 There’s an amazing “butler’s pantry” area of the kitchen. 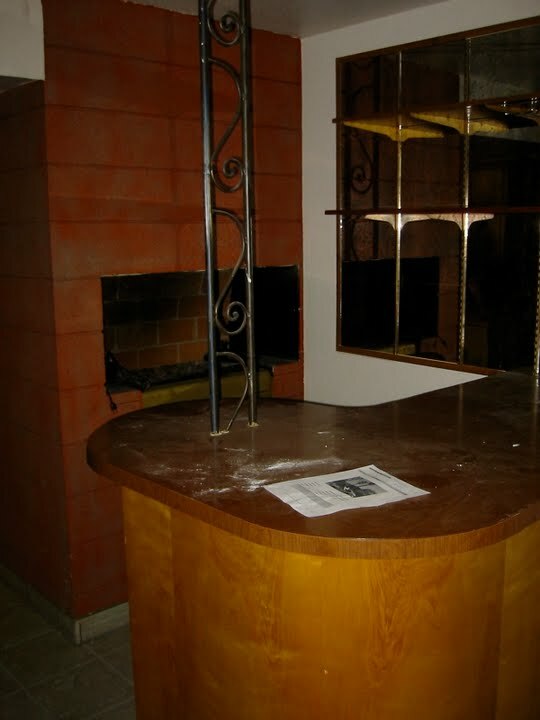 It includes a bar with an indoor rotisserie oven that’s the back of the fireplace. Here’s the before. 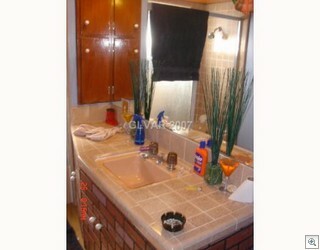 The Master Bedroom and Bath were special challenges. Especially trying to paint out the Mondarian color blocks that I had mentioned the other day. 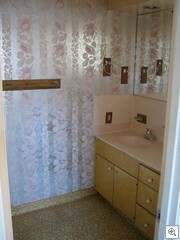 Removing the foil wall paper wasn’t fun either. But now it’s all cleaned up and looking good. 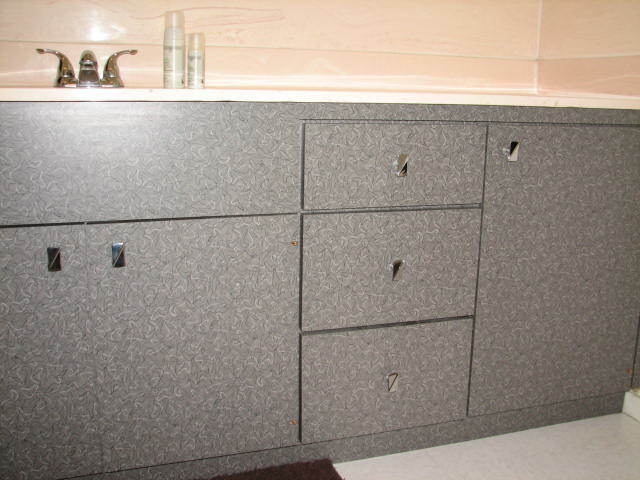 The cultured marble countertop in the bathroom was salvageable, and the cabinets were refaced with Charcoal Boomerang Formica. 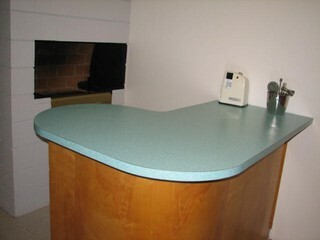 I hope you enjoyed seeing the dramatic change that retrovating can accomplish. So much more fun than doing one over in Mediterranean cookie cutter. If you’ve done a project or a room or a whole house that you’d like to have showcased, drop me a line or give me a call.